The general warming trend met with its first major change in 1918. Suddenly the moderate increase received a major push. The rise accelerated in the North, particularly in Europe, for two decades. This change was due to a sudden and Severe Warming at Spitsbergen in the second half of 1918. This change can be dated very precisely to a time frame of six months. This very short period of time is closely related to the most destructive phase of naval warfare in the North Sea and around Britain from the end of 1916 to 1918. 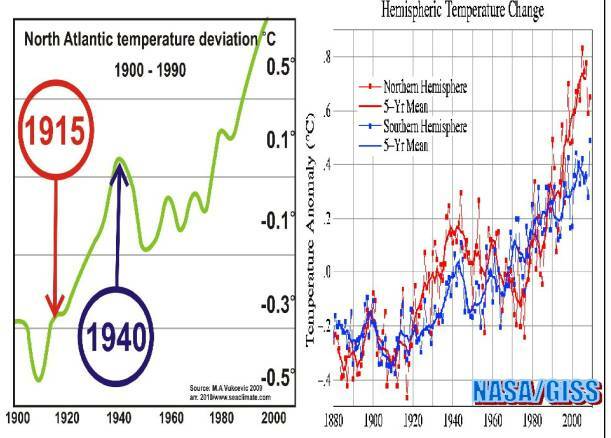 The ‘accelerated’ warming trend observed since 1918 ended in the middle of December 1939. The war at sea in the North Sea had blocked the Westerlies from passing through Western Europe. The region where the halt came can be located as the coastal corridor from the Helgoland Bight in the North Sea and in the Baltic Sea from Kiel to Königsberg (Kaliningrad). Only 100 days earlier Hitler had started the Second World War, and the coastal waters mentioned were particularly affected by naval activities and had succumbed to arctic winter conditions.